An iconic 19th century corner-shophouse situated at the crossroad of Jalan Tan Hiok Nee and Jalan Pahang. 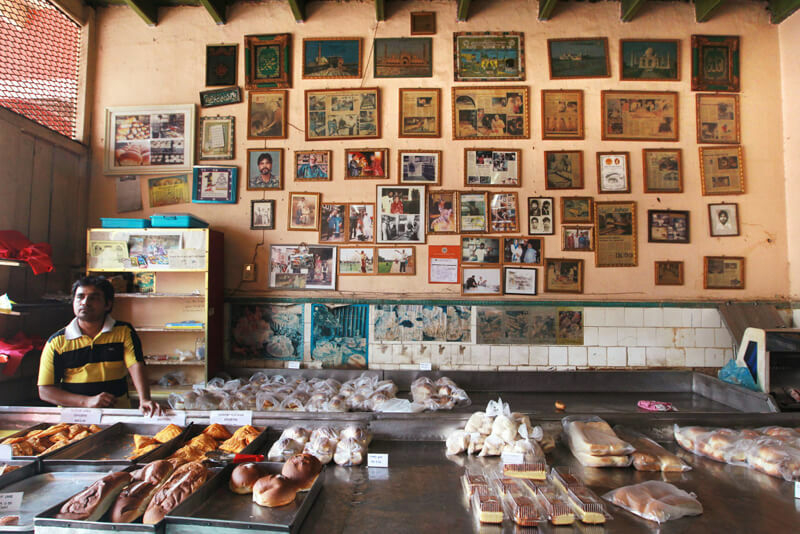 The 80-year-old Salahuddin Bakery is one of the oldest bakeries in Johor. 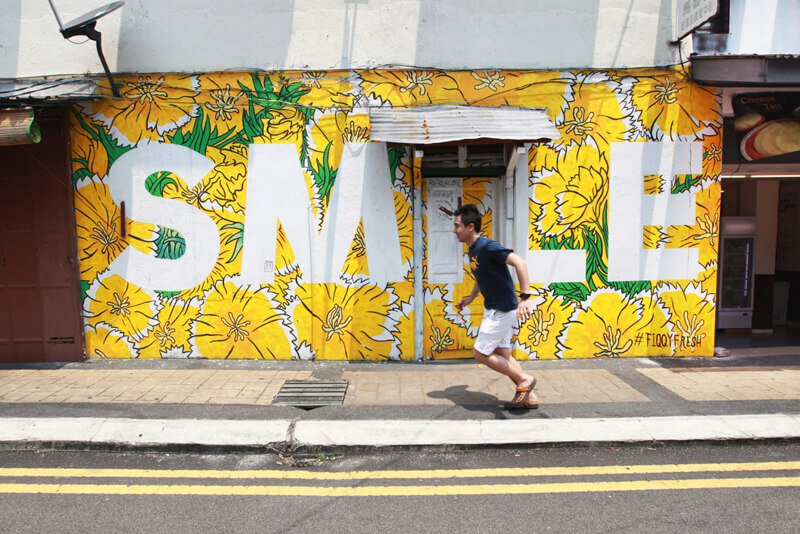 The old town area is a perfect place for mural hunting. 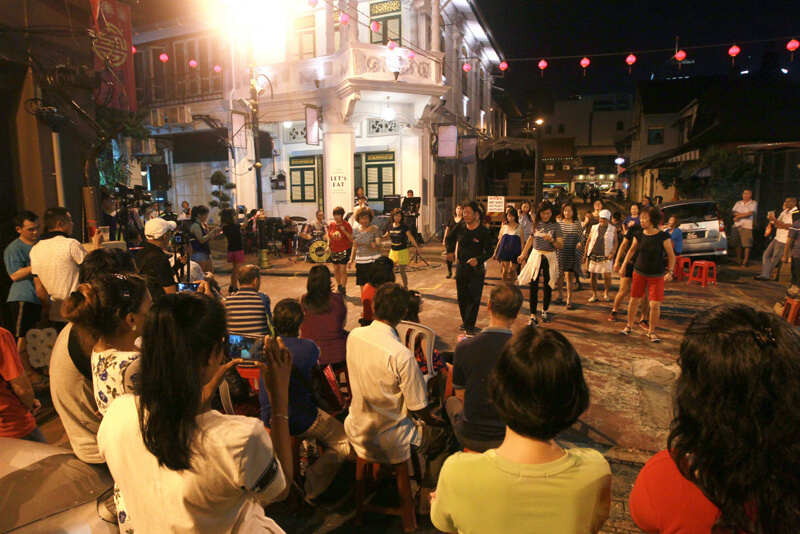 A lively Saturday night at Jalan Tan Hiok Nee with people singing and dancing. Featuring local F&B and all sorts of merchandise, Pasar Karat is one of the best places to discover the diversity of the old town. Formerly known as Roost Juice Bar, Flowers in the Window is one of the most sought-after cafes in the area. 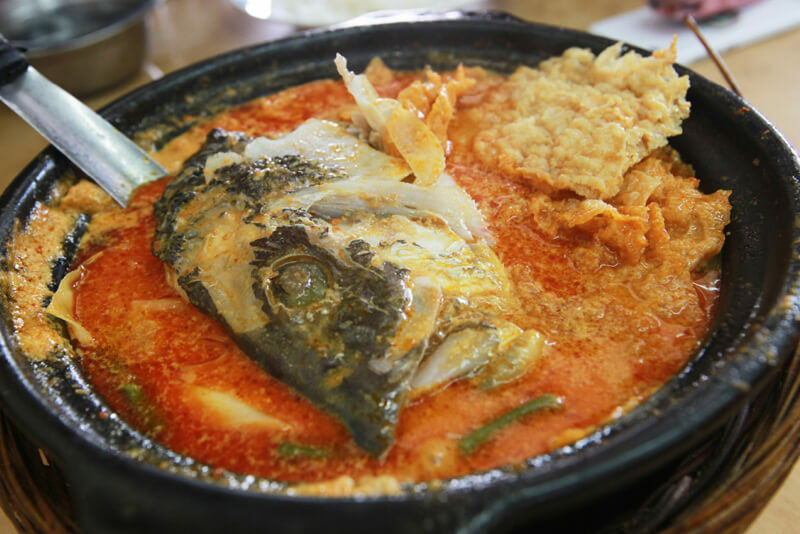 Restaurant Kam Long Ah Zai’s claypot curry fish head is a tasty delicacy worth waiting for. 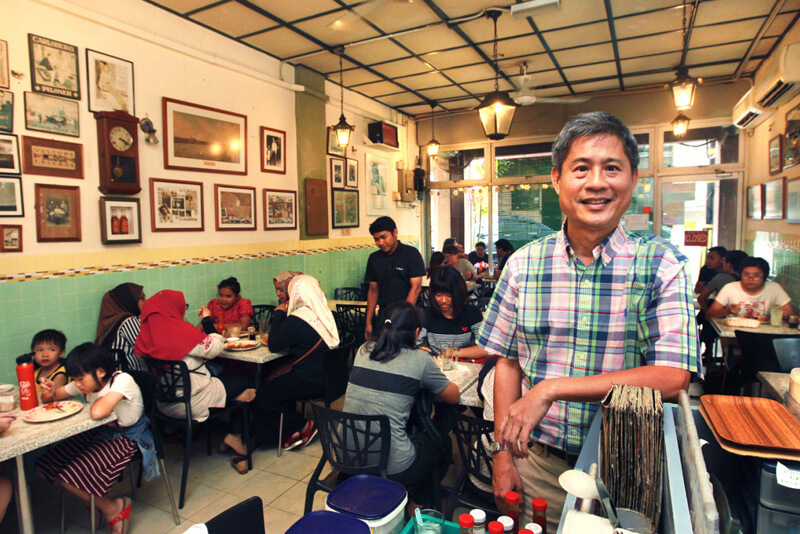 Jian is the third-generation owner of Restaurant IT Roo Cafe. Restaurant IT Roo Cafe's most famous dish is the authentic Hainanese chicken chop with mushroom gravy, served with coleslaw and potato wedges. Restaurant Hua Mui is a popular hangout place, even for members of the Johor royal family. LOCATED at the southern tip of Peninsular Malaysia, Johor Bahru (JB) is an established city founded on a trove of history, culture and intriguing stories. This capital city of Johor is also made up of an enchanting blend of the ancient and the modern — from a retro bakery shop with almost a century of history to the soon-to-be tallest residential tower in Southeast Asia. One of the best places to experience this harmony in diversity is probably the old town area, which houses plenty of long-established shops along with new cafes, restaurants and businesses in several streets, including Jalan Dhoby, Jalan Tan Hiok Nee, Jalan Pahang, Jalan Ibrahim, Jalan Trus, Jalan Wong Ah Fook, Jalan Meldrum and Jalan Tun Abdul Razak. During the 1970s to 1990s, the old town of JB was a lively hub where all the action was. Soon after the golden age though, young people started to gradually leave the town for other emerging areas, and the population of the once-vibrant district dwindled. Eager to preserve its legacy and revive its robustness, local clan associations and the city council set in motion various rejuvenation actions in the early 2000s. One of the major initiatives was to transform Jalan Tan Hiok Nee into a cultural artery similar to Jonker Street in Melaka. Declared a heritage street in October 2009 by the then-Johor Menteri Besar, it was named after Major China Datuk Tan Hiok Nee, who was one of the port owners under the Kangchu system. According to the Tan Hiok Nee Heritage Walk Committee, which is responsible for the project, they started executing the plan sometime in 2008 by organising events and free courses, as well as working with non-governmental organisations and authorities to promote the area. Thanks to the support and help from the local community, city council and associations, Jalan Tan Hiok Nee has now become a vibrant display of the past rubbing shoulders with the present. Besides antiquated local shops, grocers, camera shops, neighbourhood restaurants, museum and clan associations’ offices, there are contemporary eateries, art galleries, boutiques, hostels and an open-air nightlife centre. One of the best representations of this eclectic mix is a 19th century corner-shophouse situated at the crossroad of Jalan Tan Hiok Nee and Jalan Pahang. 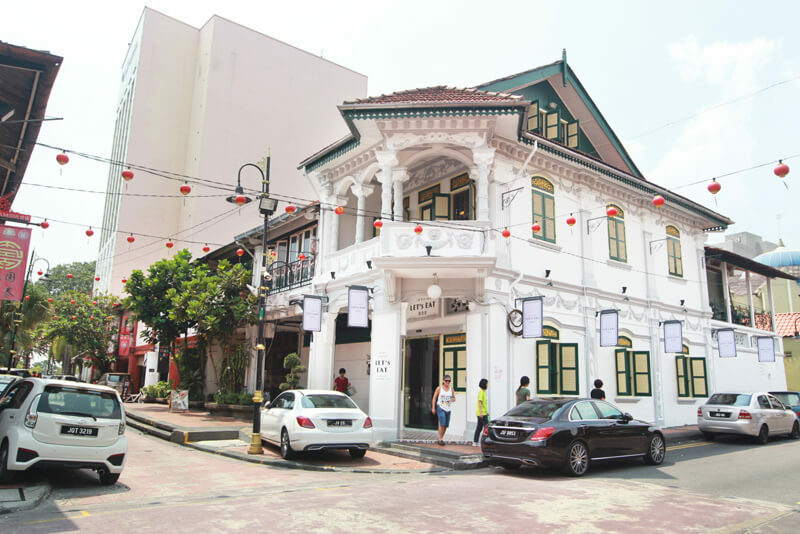 Formerly known as the Red House, the vintage Nyonya architectural-styled building has been repainted in white and leased to Let’s Eat Restaurant, which opened its doors in September 2017. During the weekends, when the shutters come down at night, the building front fills up with festive activities, live band and cultural performances. 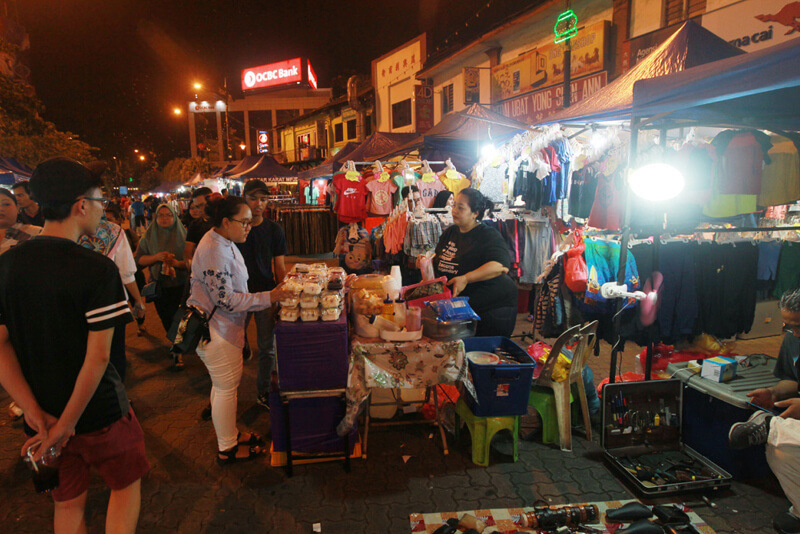 There is also a night bazaar dubbed “Pasar Karat” held along Jalan Tan Hiok Nee, Jalan Segget and the adjacent streets, enlivening the atmosphere with the patter of traders, conversation and the smell of food in the air. Not far away from Let’s Eat is Hookah District, where you can find an F&B outlet, a hair saloon, a karaoke and boutiques housed in nine containers that were sourced from Port Klang. Located between Chaiwalla & Co Container Cafe and Big Bites Cafe, Hookah District is an open-air car park during the day. However, when the sun makes its exit, so do the cars, as the merry-makers will turn the place into a bubbly hang-out to enjoy hookah (or shisha), gastronomical delights, shopping and even a haircut. Mooted as a place where one can find everything under the sun, or rather, the moon, it is the brainchild of Farouk, owner of Hookah District. Having hunted down the landlords, he finally managed to convince them to lease him the parking space. Birthed in March 2017, Hookah District has today become one of the popular spots where throngs of people spend their nights chilling. The rejuvenation of Jalan Tan Hiok Nee caught on and soon the adjacent streets joined the ranks, awakening the drowsy old town. Some Johoreans have been drawn to return to their birthplace to play their parts, such as 37-year old Sea Wong, proprietor of the famous Roost Repurposed & Recycled and Flowers in the Window cafes at Jalan Dhoby. “I had lived in Australia for one year and I like their cafes very much, so it inspired me to start my own when I came back to my hometown,” he shares. Flowers in the Window, formerly known as Roost Juice Bar, is probably one of the earliest hipster cafes that brought new life to the old town area. The cafe began in 2005 with rustic wood furniture sourced from junkyards and recycling sites to create a 1970s vintage setting. Today, the cafe has been revamped and serves desserts with a floral theme. Alongside the chic food joints, there are many traditional cuisine outlets tucked in the old town. Boasting age-old platters, they are never short of patrons who have similarly spanned generations. One of them is Restaurant Kam Long Ah Zai, which is well known for its tasty claypot curry fish head. 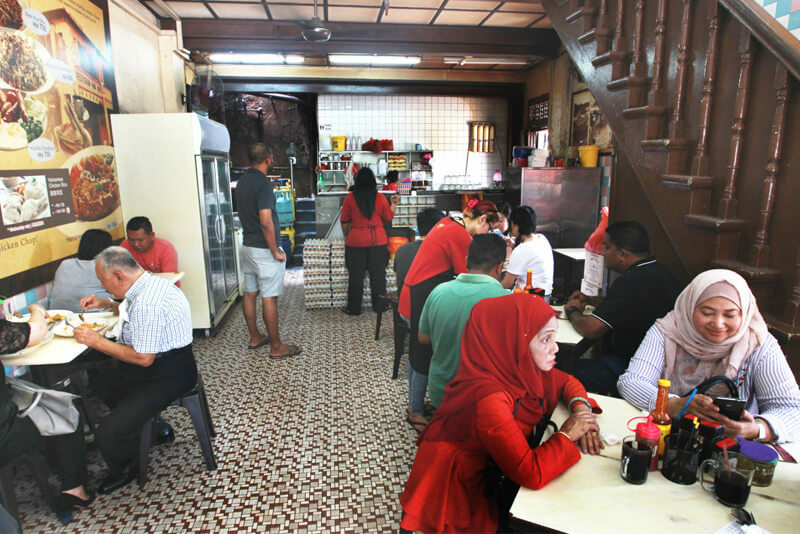 Located at Jalan Wong Ah Fook, the 34-year-old restaurant attracts both locals and tourists who queue up at the entrance daily. The 57-year-old founder Yong Cheng Kooi is still running the business today with his children’s help. According to Yong See Yen, daughter of Cheng Kooi, the secret to the steaming hot, aromatic signature dish lies in the fresh ingredients sourced daily from their suppliers, such as red seabream, red snapper, black snapper and various veggies. Another mouth-watering sought-after dish is the Hainanese chicken chop. With a significant community of Hainanese descent in JB, a number of well-established restaurants can be found serving this popular meal. 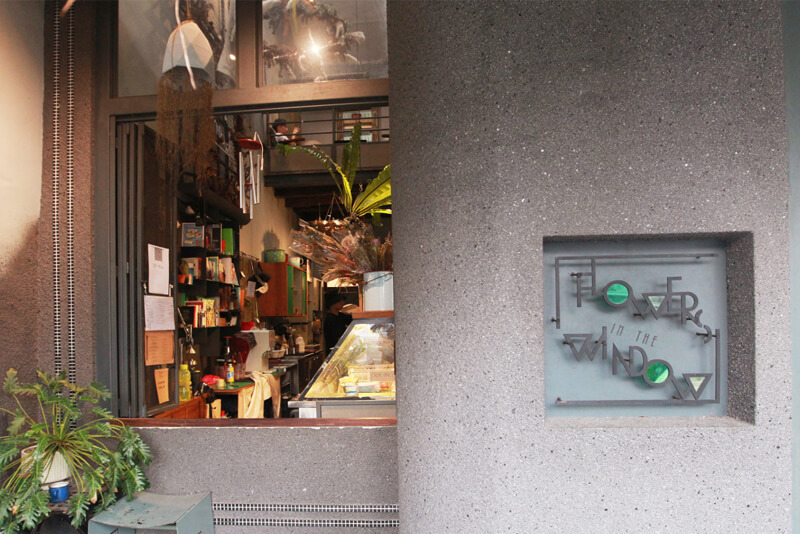 Among them is Restaurant IT Roo Cafe in Jalan Dhoby, founded by Jian Hye Jeoin in 1961. 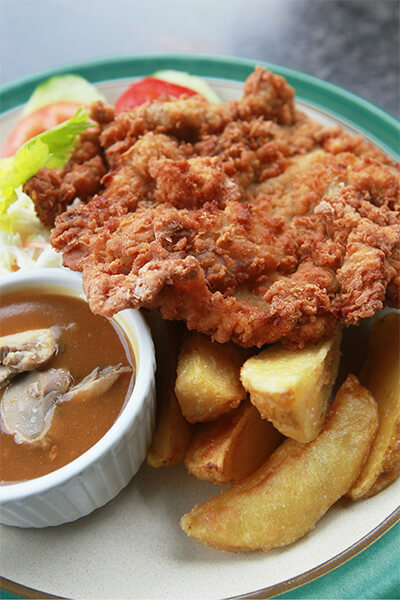 Claiming itself as having the best chicken chop in town, it is well known for its fried chicken chop with mushroom gravy or black pepper sauce, served with coleslaw and potato wedges. “The core ingredients for the chicken chop has remained unchanged till today, but we do tweak the recipes of some of the sauces by adding in some spice to enhance the flavour,” reveals Robin Jian, the current third-generation owner. Meanwhile, the 71-year-old Restaurant Hua Mui at Jalan Trus is not only famous for its Hainanese chicken chop, but also its “roti bakar” (toast) and coffee. According to Jeremy Chiang, who has taken over the venture from his parents and grandparents, the restaurant is able to sell 200 to 300 pieces of chicken chop on average per day. “The Johor royalty are regular customers here. Even His Majesty Sultan Ibrahim Ismail has been here twice in the past to ‘minum kopi’,” he says. This story first appeared in EdgeProp.my live! magazine. Download a FREE copy of live! magazine here.